This clearly written and well-focused volume combines concise decisions of the primary areas of communication law with the foundational case decisions in those domains. Thus, in one volume, students of communication law, constitutional law, political science, and related fields find both the key rulings that define each area of law and a detailed summary of the legal concepts, doctrines, and policies so vital to understanding the rulings within their legal context. The text forgoes the tendency to provide encyclopedic treatment of all the relevant cases and focuses instead on the two or three cases most vital to an accurate and informed understanding of the current state of each field of communication law. The chapters provide readers with the most salient concepts and the necessary depth to understand the law while permitting most reading time to be directed to the law itself. Full-text rulings allow readers to immerse themselves in the law itself--to develop a feel for its complexity, its flexibility, and its language. 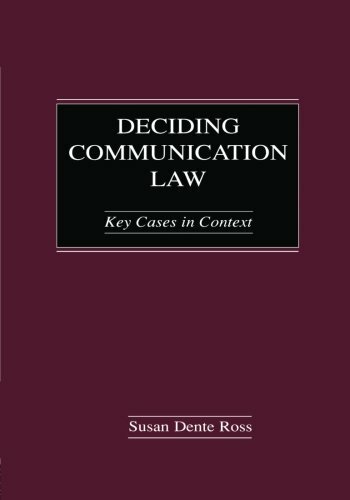 Useful as a quick reference to the landmark rulings and the jurisprudence of communication law, this book also serves well as the primary text in related undergraduate courses or as a supplemental text in graduate classes in the field.